On Thursday, 7/25 7pm, I’ll be teaching a memoir workshop at the Bryant Park Reading Room. Details can be found here, and you can register for it here. It’ll be a mixture of lecture and actual writing, so sharpen those pencils! 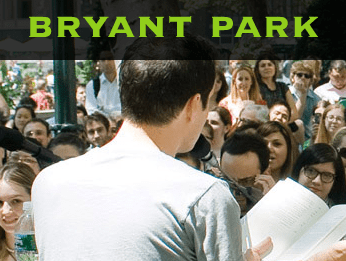 This entry was posted in Events, News, Uncategorized, Writers and Writing and tagged bryant park, word for word. Bookmark the permalink. Just got back from attending this. Thanks for the workshop and for sharing your insights on what makes a good memoir essay. It’s funny that you mentioned that you were pinch hitting for another author who normally does this series at Bryant Park because you were the reason I came to this session. I read and really enjoyed your piece in the Times Lives Section about your realization of the transient nature of all seemingly regular rituals. It’s something I’ve been thinking about a lot lately — especially after having children, I’m super aware of just how fleeting these moments that seem to be neverending really are. And I also identified with the Asian American (or more generally, first generation immigrant) bent to your writing. I wish you much continued success. Thanks so much for your kind words — I’m so glad you found the workshop helpful. You’re absolutely right about the transient nature of rituals — if there is one thing we can count on in this world, it is definitely change. It was such a great crowd tonight, just a wonderful evening throughout. Thank you for being there! What would you suggest for someone who’s interested in writing and learning more about writing, but doesn’t have a background in it? I got my Ph.D. in physics from Cornell (I noticed you went there too! ), but have always been interested in writing. Beyond writing for my undegrad newspaper however, I don’t have any experience. I’d love to apply to an MFA program, but don’t have the credentials to do that. Are there any classes you’d recommend, summer programs, or other avenues to explore? Great to meet a fellow Cornellian! If you enjoy writing, there are virtual communities like Zoetrope Studios (http://www.zoetrope.com/tour.cgi) — you can submit stories and get feedback, a sort of a virtual workshop. That way, you can get your feet wet without too much of an investment. Another suggestion would be to check out magazines like Poets and Writers, which often have articles that delve into this very subject. And you can’t go wrong with reading — find authors you like to read and examine their style, their voice, how they put the book together. Good luck!